6 Week Sleep Regression, or Growth Spurt? Sound familiar? We hear this all. the. time. Our answers vary, depending on the unique baby in question – in our experience, the answer can be anything from teething to illness to temperament to birth of a new sibling to nap transition. But often, our answer is – sleep regression. But recently, we’ve been hearing more and more from parents about their 6 week old babies going through what seems like a sleep regression – baby was sleeping pretty well (for a newborn, anyway), but around 6 weeks, mom and dad are up every hour, baby is feeding constantly…what gives? Is this a 6 week sleep regression, or is it something else? First, let’s start with the definition of ‘sleep regression’. Remember, a sleep regression generally describes a phase or season in which a baby who normally sleeps well suddenly starts waking more often at night, and refusing naps (or taking very short naps) – for no apparent reason at all. 6 Week Sleep Regression, or 6 Week Growth Spurt? If your 6 week old baby is currently struggling to sleep well, you may be looking at that list and nodding your head – it may be that your baby has all those symptoms! But here’s the thing to remember – most babies also go through a pretty pronounced growth spurt at 6 weeks, too. And that growth spurt will likely have your baby waking more often, and seeming to be fussier than usual, simply because your baby will be hungrier than usual, and will need more feedings. So which is it? Sleep regression, or growth spurt? Both, actually – it’s a double whammy! In addition to a short, 2-3 day (or perhaps 1 week) growth spurt at 6 weeks, most babies also experience something that Weissbluth calls “the peak of fussiness”. By 6 weeks of age, most babies are growing out of their drowsy newborn state, and are starting to perk up and notice the world. And that world is quite overwhelming for them – so many sights and sounds and smells! What’s more, all that observing can really wear a baby out, causing overtiredness and increased fussiness. 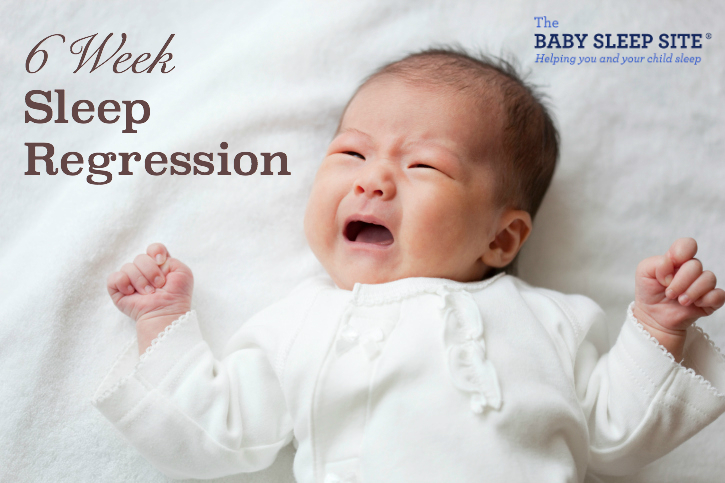 If your 6 week old is struggling with sleep, it’s most likely due to this one-two punch: it’s the 6 week growth spurt AND that 6 week “peak of fussiness.” (Of course, you’ll want to rule out illness or another source of discomfort first, if your baby is extra-fussy around 6 weeks). Take comfort in the fact that this phase won’t last long – the growth spurt will last just a few days, and even the “peak of fussiness” will last about a week or so – not nearly as long as a regular sleep regression. Once this phase passes, you should see your baby’s sleep improve again (that is, until the 4 month sleep regression hits!). When it comes to soothing your baby during the 6 week baby growth spurt, you’ll want to stick with gentle techniques – your 6 week old baby is still a newborn, after all! For do-it-yourself sleep coaching help, check out our Members Area, packed with exclusive content and resources: e-Books, assessments, detailed case studies, expert advice, peer support, and more. It actually costs less to join than buying products separately! And this is one baby sleep resource that will grow with your child – our member resources are designed to help you during the newborn stage, as well as the baby and toddler stages! As a member, you’ll also enjoy a weekly chat with an expert sleep consultant, as well as access to ALL our newborn resources. And the best part – members receive 20% off all sleep consultation services! Need help encouraging your newborn to sleep better, and to sleep longer stretches at night and during the day? We have a great resource designed to do just that. Check out Essential Keys to Your Newborn’s Sleep, the latest e-Book from The Baby Sleep Site®. Available in PDF format as well as a variety of e-reader formats, Essential Keys to Your Newborn’s Sleep is the tired parents’ #1 newborn resource. Developed by Nicole and Miriam (a lactation consultant, nurse, and Baby Sleep Site® sleep consultant), Essential Keys lays out everything you need to know about helping your baby to sleep better right from the start. It also includes information on feeding (both breast and bottle), baby communication, bonding with baby, daily routines, sample sleep schedules, and more. Download your copy today! Interested in personalized, one-on-one help for your newborn? Why not consider one of our personalized sleep consulting packages? Our consultations allow you to work directly with one of our expert sleep consultants, and to get a Personalized Sleep Plan™ that will work for your family. First, browse our list of package options and select the one that looks best for your situation. Once you make your choice and purchase, you will immediately receive an e-mail with your Helpdesk login information. You’ll be able to log in and start your Family Sleep History form right away – it’s that simple! Tell us about your 6 week old baby’s sleep! Did you (or are you) experiencing what feels like a sleep regression? Need Newborn Sleep Help? We Have the Resources You Need! If you are tired of wading through stacks of baby sleep books that just aren't working, if you are beyond exhausted and just can't solve your newborn's sleep problems on your own...than personalized sleep consulting is for you. We have been around since 2008 and invite you to tap into 10+ years of experience. Our team of expert consultants will create a Personalized Sleep Plan® just for your family and then support you through every step of implementing your plan. We encourage you to consider our personalized, one-on-one baby and toddler sleep consultation packages if you want to see real, meaningful results now. Your consultation package also includes ample follow-up help, designed to help you troubleshoot problems and tweak your plan as needed. For even more help getting your newborn baby to sleep, check out our e-Book, Essential Keys to Your Newborn's Sleep . At over 90 pages long (and containing a variety of sample schedules for breastfed and formula-fed babies from birth - 16 weeks), this e-Book truly is a one-stop resource designed to help your newborn establish healthy sleep habits, right from birth. Whether you're a brand new parent or an experienced parents who needs to brush up newborn sleep basics, Essential Keys To Your Newborn's Sleep is a comprehensive and budget-friendly resource that will provide the information you need to work towards excellent sleep for your whole family, from day one. Grab your copy today! Or, join our Members Area that will grow with your family. It's packed with exclusive content and resources: e-Books, assessments, detailed case studies, expert advice, peer support, and more and actually costs less to join than buying products separately! As a member, you'll also enjoy a weekly chat with an expert sleep consultant. And the best part - members receive 20% off all sleep consultation services! This is a resource that will truly grow with your child: it'll help you through the newborn phase and prepare you for the months ahead. Sleep Regression, or Growth Spurt? Or Both? Yes this is exactly what we are experiencing. We are 6 and a half weeks with my little one. This week has been something else, light sleeping, short naps, loud fussiness and waking up much more often in the night is unlike him. Good to hear we aren’t the only ones going through it and can expect it to be over soon. @Sara – Hang in there! Yes I have definitely been experiencing this today. I was so pleased at how well he was napping and sleeping yesterday and today literally one 1 hour nap and up the rest of the day with 5 to 10 min cat naps. Thanks a lot for this info. It’s great to know what’s going on. @Christina, we are glad we could help you navigate through the phase your little one is in! Congrats on your new baby!